Every disc is composed of the nucleus pulposus, annulus fibrosus and vertebral end-plates. The nucleus is the central gelatinous part of the disc and the annulus fibrosus is the outer ring. The healthy disc is normally avascular. The posterior (dorsal) part of annulus fibrosus is innervated by branches of the recurrent meningeal nerve (sinuvertebral nerve), which is a branch of the ramus communicans connecting the spinal nerve with the sympathetic chain. The recurrent meningeal nerve (sinuvertebral nerve) courses ventrally along the nerve root and goes back into the spinal canal in order to create a network of smaller interconnected nerve branches which innervate the posterior longitudinal ligament and the anterior dura mater. The innervation of the vertebral body is provided by the same nerve network. The anterior longitudinal ligament is innervated by a network of nerve fibers emerging from the sympathetic chain bilaterally. 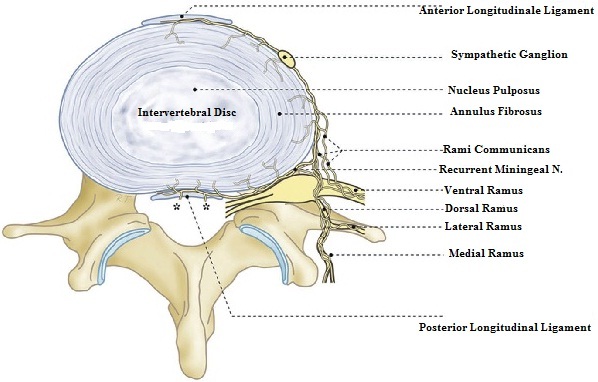 The anterior and lateral parts of the annulus fibrosus of the intervertebral disc are innervated by rami of the sympathetic chain: the ramus communicans and the network enclosed in the anterior longitudinal ligament. Given that pain signals travel to the spinal cord through the sympathetic chain, many researchers pioneered by NAKAMURA, believe that disc-induced pain signals are transmitted from every lumbar level of the spine to the dorsal root ganglion (DRG) of the 2nd lumbar spinal nerve and, through the spinal cord, finally reach the brain. As mentioned above, nerve fibers innervating the posterior part of the disc and posterior longitudinal ligament create a nerve fibre network and are interconnected sidewards and upwards. This explains why patients with intervertebral disc degeneration very frequently complain about central pain in the spine radiating alternatively leftwards or rightwards. 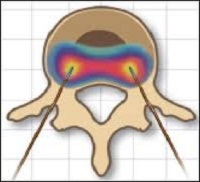 The fact that pain signals coming from low back degenerated discs end up to DRG of the 2nd lumbar spinal nerve, explains why many patients complaining about chronic pain in the groin region (corresponding as to dermatome to L2 spinal root) suffer from IDD of the lower intervertebral discs of the lumbar spine. 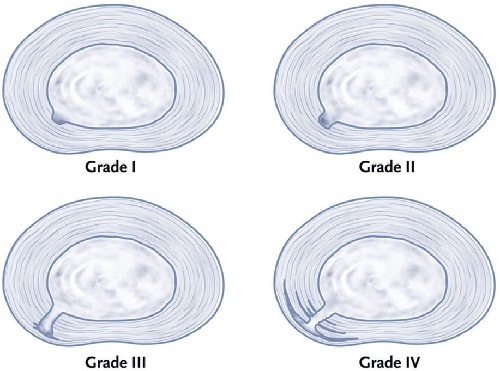 The progressive intradiscal degeneration results in the nucleus dehydration and leads to circumferential or/and radial tears of the annulus fibrosus (annular tears). 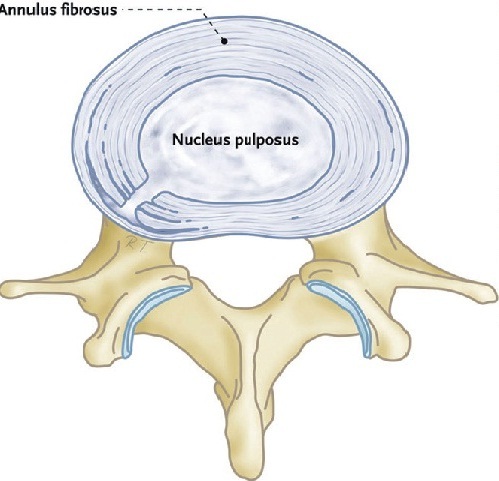 When the degeneration advances, these annular tears extend up to the outer third of annulus fibrosus and the nucleus material stimulates neogenesis of a vascular network and of nociceptors outside and sometimes inside the disc. The stimulation of these nociceptors through various mechanisms (involved in patients’ daily activities), leads to chronic low back pain of discogenic aetiology. Patients often describe a recent attack of acute stabbing pain, which was induced by the acute rupture of the inner part of the intervertebral disc. Patients with lumbar DDD usually complain about a cenral pain in the low back, which aggravates with bending, getting up, prolonged standing and sitting, and subsides when lying down. The pain may radiate down to the buttocks and lower limbs usually up to knee height, and only rarely does it have radicular nerve distribution that extends to the feet. In some rare cases the pain is distributed to the groin region and upper medial thigh or/and the lateral part of the scrotum. Disc degeneration between the 3rd and 4th vertebrae usually induces pain radiating to the anterior thigh. Disc degeneration between the 4th and 5th vertebrae usually induces pain radiating to the lateral thigh and sometimes to the posterior thigh, and finally when the degenerated disc is between L5 and S1, the pain radiates to the posterior thigh. MRI provides detailed information on anatomical abnormalities of the spine. In case of DDD-induced pain, the morphological findings are considered to be just indications and not diagnostic evidence for the pain aetiology. 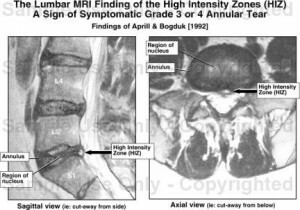 Many patients with MRI disc degeneration findings do not complain about any pain. The presence of a high intensity zone (HIZ) in the MRI has been correlated with the presence of discogenic pain at the same level. HIZ may be an indication of annular tear extending up to the outer third of the annulus fibrosus. HIZ may be due to the presence of inflammatory cytokines. Some investigators support that there is 80% correlation between HIZ and discogenic pain, while others believe that HIZ is normally present in asymptomatic patients as well. Degeneration of the 1st and 2nd degree are almost always painless. Degeneration of the 3rd degree induces pain during discography in 75% of patients . Degeneration of the 4th degree is the most severe form of degeneration and almost always manifested with pain. In general terms, anti-inflammatory drugs and mild opioids are recommended for a short period of time (up to three months). Systematic review has not revealed additional benefit compared to active theraupeutic exercises, rest and other conservative treatments, such as spinal traction, chiropractic therapy, hot packs and support belts. Should the conservative treatment fail and the patient keeps complaining about disturbing pain restricting him/her in daily activities, s/he has to be treated with minimally invasive therapeutic techniques. Α) Transforaminal Epidural Corticosteroid Injection. There is no evidence for the therapeutic result of epidural corticosteroid injection. There are reports about cases where pain was improved but the pain relief period was short. However, there are also reports of other cases where pain did not improve at all. The radiofrequency application lasts 15 minutes and the temperature elevation achieved deactivates the nociceptors developed in the annulus fibrosus of the posterior disc surface. The therapeutic result of this specific therapeutic technique is apparent about 2 months later and in the meantime the patient follows a special exercise and activity program. This is a relatively new but well-promising technique. There are some observation studies and individual case reports showing great improvement, but the results of evidence-based studies are still to be expected. review of outcome studies, diagnostic accuracy, and principles. Reg Anesth Pain Med. 2005;30:163–183. 576 • kallewaard et al. disruption in patients with chronic low back pain. Spine. drawings and CT/discography. Clin J Pain. 1999;15:210–217. 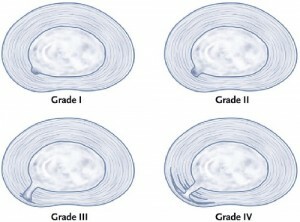 disc pathology. Eur Spine J. 1999;8:126–131. low back pain. Orthop Clin North Am. 2004;35:7–16. treatment of lumbar discogenic pain—a review of the literature. pain on magnetic resonance imaging with discography correlation. subjects with a meta-analysis of false-positive rates. Pain Physician. 19. Coppes MH, Marani E, Thomeer RT, Groen GJ. disc in chronic back pain. Lancet. 1997;350:178–181. 23. Peng B, Chen J, Kuang Z, Li D, Pang X, Zhang X.
painful disc fibrosis and degeneration. Spine (Phila Pa 1976). intervertebral disc. J Pathol. 2002;197:286–292. in low-back disorders. Spine. 1987;12:287–294. 28. Vanharanta H, Sachs BL, Spivey MA, et al. M. Lumbar discography: should we use prophylactic antibiotics? 32. Seo KS, Derby R, Date ES, Lee SH, Kim BJ, Lee CH. 33. Shin DA, Kim SH, Han IB, Rhim SC, Kim HI.